PrismEnvironmental® SuperBowl™ Cleaner is a safer, powerful alternative to hydrochloric acid bowl cleaners. 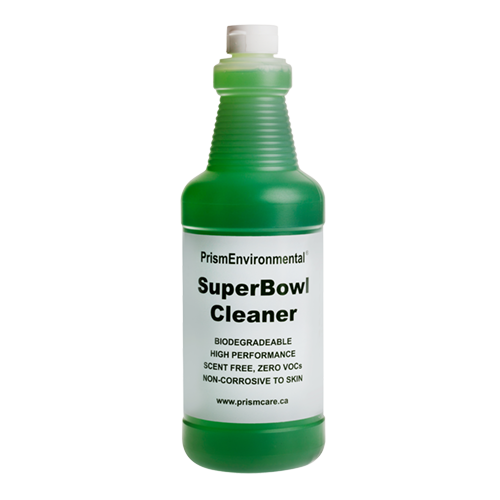 SuperBowl offers more than double the effectiveness of leading phosphoric-acid bowl cleaners. It rapidly cleans and removes lime, scale, rust stains, soap scum, mold and mildew, in addition to dirt and grime from urinals, bath tubs, tiles, grout, water fountains, etc. SuperBowl™ Cleaner is gentle enough to remove rust stains from carpets.